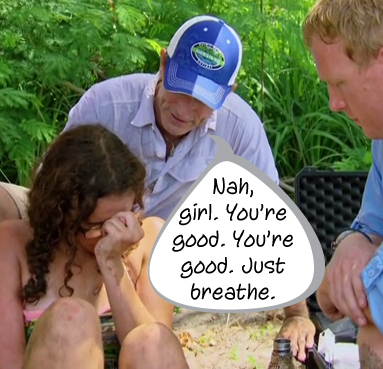 When Vanua returns to camp after voting out CeCe, it’s all good feelings. David knows it was the right thing to do because it’s all about being in an alliance for yourself first and foremost. And Zeke is sooo happy with his position in the game at the moment. He’s got Michelle and Chris to work with moving forward. The next day at Ikabula, spirits are low because everyone is hungry. Jay didn’t have a dad growing up so he’s always felt responsible for taking care of his mom and sister – he’s winning this game for them. He asks Will if he wants to go look for coconuts with him so they leave camp – to go look for a hidden Idol. When Jay spies a piece of bamboo with the tribe emblem on it, he knows he’s found something and after he smashes the bamboo open, he unwraps the Idol. Unfortunately for them, Michaela walks into the shot and the cat is out of the bag. For now, Michaela is going to keep the info to herself, she is working with Jay so she’ll be cool, but if she catches wind that something crazy could happen – she’s telling everyone that he has an Idol. And Jay is not happy at all that Michaela has the information. Come on in, guys! It’s time for Reward! Up for grabs? The tribe finishing in first place will get to feast on apple pie, cookies, brownies, milk, and iced tea; second place finisher will get a bowl of cookies. In this challenge, one tribe member will guide three blindfolded tribe members around a course to collect bundles of puzzle pieces. Once all bundles have been collected, the caller will guide a tribe member to solve the picture puzzle. First two tribes to finish win reward. Survivors ready? GO! No wait! But first… Before Jeff explains the challenge and announces the reward… When Figgy sees that her good buddy Michelle is still around, she’s not shy about telling everyone that she and Michelle are close. Jeff is like, uh, does that worry you Michelle? Her being so vocal about your closeness? She says no – that the truth can work well in this game… Okay, for real: Survivors ready? GO! 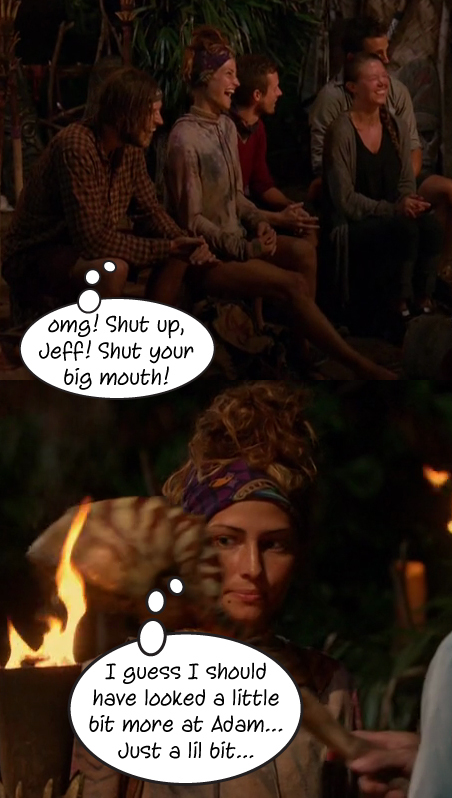 So, Jess, Bret, and Hannah are all sitting this challenge out; Figgy is calling for Takali, Jay for Ikabula, and Michelle is doing her BEST to try to call for Vanua, but Dave is having a real hard time with left and right. Michelle even has to ask Chris to help her call to Dave. Meanwhile, the other tribes are doing pretty well working together. Adam is the first to deliver a bundle of pieces for Takali, Sunday for Ikabula does the same. And before you know it, Will has delivered another, but Taylor and Ken add another two bundles for Takali at the same time – they have one set left to collect. And Takali is the first to start untying pieces and get a good head start, but before you know it, all tribes are working on the puzzle. And this is when Hannah starts feeling wonky. Jeff tells her to go sit in the shade and to let him know as soon as possible if she needs medical. Her urges her to not hesitate. Back to the challenge, Zeke and Michelle are working REALLY well together to solve this puzzle and Takali’s lead is all, but gone. Figgy can’t figure out what she’s done wrong and BAM! Vanua wins first reward and Ikabula is making good progress… Over in the shade, Hannah says she feels tingly and she can’t feel her hands and Bret is with her now, comforting her. Back in the challenge, Ikabula has solved the puzzle and won the second reward. Jeff now sees that Bret is with Hannah; she tells Jeff she doesn’t know if she’s just panicking or if she’s just dehydrated. Jeff calls in Medical. Dr. Joe tells her that she’s just over-excited, she’s breathing too quickly, and that she’ll be fine, she just need to calm herself down and breathe easy. Hannah knows all this; she is prone to panic attacks and just didn’t want everyone to see it happen. Jeff commends her for coming out to play Survivor, despite this vulnerability she sees in herself because of her anxiety issues. And everything is fine after just a little bit of time, then Jeff dispenses the rewards, gives Takali and Figgy a little jab like he does every time a tribe loses – I think it’s to keep them motivated – Then we’re back in the game. Well sorta back in the game because at Vanua, everyone is feeling really great and it’s almost like they are NOT in the game at the moment, but everything is not as it seems. While Zeke gives Michelle 100% of the credit for them winning the challenge, he knows that she’s a threat to his game especially after the whole Figgy debacle before the challenge. Figgy was sooo happy to see Michelle, but not so much about Zeke – she acknowledged he was still there too, but it was an after-thought. Zeke thinks he’ll have to start working with Gen Xers now because the Millennials were plotting against him before and Figgy and Michelle will still work together when the tribes are merged. He’s still on the bottom with Michelle. Over at the Ikabula camp, Hannah talking with Sunday about what happened at the challenge; she knows people are going to make fun of her for needing medical even though she wasn’t even competing. It’s just all the build -up panic she’s been storing away and he mind was racing during the challenge. She just has to keep reminding herself to take little breaks from the game and relax, she has to stay in the mind-set that she’s good at this game, and she just has to stay the course within herself. Bouncing over to Takali… Figgy & Taylor are stealing kisses and hugs every chance they get, but Figlor/Figtails is starting to feel like they should just come clean with Jess and Ken about their couple status. They’ve got Adam on their side, everyone else on their Millennials tribe knows, and Taylor doesn’t think it’s going to hurt their game at all. So! Figgy practices with Taylor first, then finds Jess on the beach and tells her about her and Taylor. Jess is all, uh, yah think? lol Jess totally knew there was something going on with them, and so did Ken, who comes into the shot mid-convo and plays like he’s shocked to hear the news. Ken thinks the “kids” are treating Survivor like a vacation, but he’s there to play and he’s going to do everything he can to stay in the game. Come on in, guys! 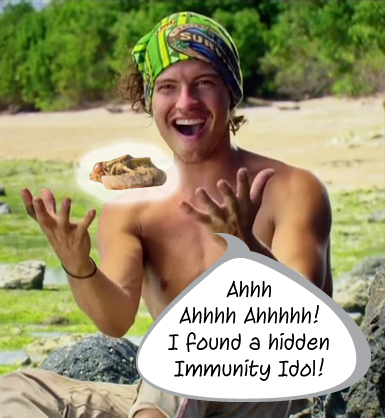 It’s time for Immunity. In this challenge, two people from each team will race across floating balance beams, climb up a pyramid, push bags of coconuts that also contain three balls then carry them to the beach. Next, the two pairs must hang the bags upside down, then two other tribe members open the bags to release the coconuts to find the balls. The balls must be maneuvered through a difficult table maze by the same two tribe members. 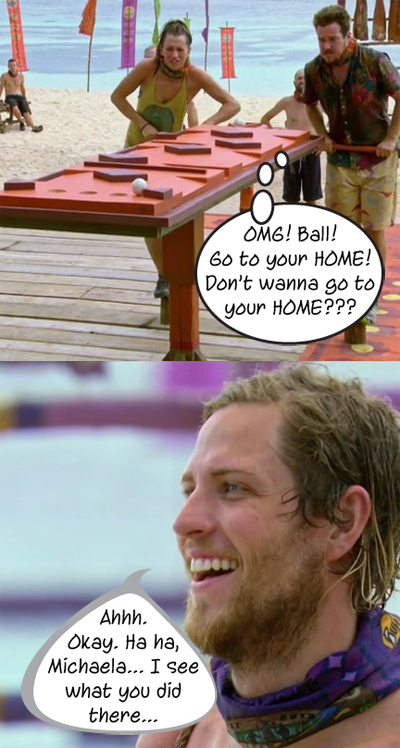 First two tribes to land all three balls at the end of the course win Immunity. Survivors ready? GO! Since it really doesn’t matter how fast Dave and Chris, Jay and Bret, and Taylor and Ken retrieve these bags because that table maze is gonna even things out and do its job as the Great Equalizer… Figgy and Jess of Takali are the first to start the table maze, with Michaela and Hannah second to start; Zeke and Michelle start soon after. But wait! Jeff left something OUT of his explanation. The people doing the maze have to stand on small logs! Ugh! Okay, so, Figgy and Jess are having no luck, neither are Zeke and Michelle who are getting a little wild because they are trying to make up time. Michaela and Hannah, though, despite Michaela barking orders at Hannah, have two balls in place before anyone else has one. Figgy and Jess finally score one, then Michaela and Hannah sink their third ball and win the first Immunity slot. Then… Michaela starts coaching Zeke and Michelle and helps them land their first ball and soon after, Figgy and Jess score a second. Michelle and Zeke aren’t far behind them, though, so it’s a race for the last ball and OMG… It’s so close for Figgy and Jess, but it slips off the side and they have to start over, but it doesn’t matter because Zeke and Michelle land their third and final ball! Takali will have a date with Jeff tonight… Before Jeff shuffles everyone back to camp, he asks Michaela why she was helping Vanua. Her reasoning is that there are two Millennials over there with two Gen Xers so she helped them to keep more Millennials safe. Taylor pipes in to say there are Millennials over on his side. Michelle says “yeah, but there are three of you. If you can’t figure out how to work together you deserve to go home”. LOL!!! Love it! So! Back at the Takali camp, Adam is fully aware that he is the swing vote and would feel really comfortable swinging his loyalty over to Ken and Jess. Alone with Figgy, who tells Adam that she’s good with him and blah blah blah, Adam suggests Ken to be the Millennials’ target, but he puts an unsure tone in his voice. When Taylor wanders over, they decide, yes Ken. 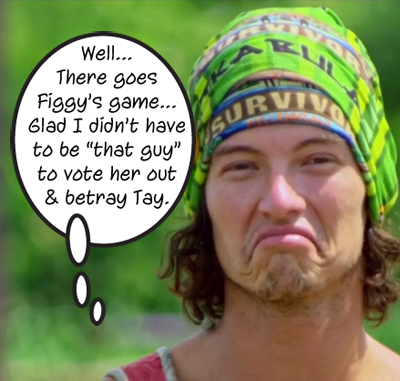 Both Figgy and Taylor confirm to us that the vote is for Ken and that Jeff will be snuffing his torch tonight. Unless, Taylor points out, Adam is smarter than they think and will flip things against Figlor/FigTails, he thinks it’s unlikely, but maybe? Back at camp, Adam has returned and Jess sits down to talk to him to let him know that if he wants to flip, they will support him. He tells her that Ken is the one Figlor/FigTails will be voting out and knowing that after Ken it will be her, Jess finds Ken to let him know that he needs to talk to Adam if he wants to fight to stay. And so he does! Ken tells Adam that he’ll have his back, he’ll never write his name down, he will fight for him THEN Ken asks him to think about who he wants to sit with – does he really want to be in the end with Taylor, Figgy, and them? 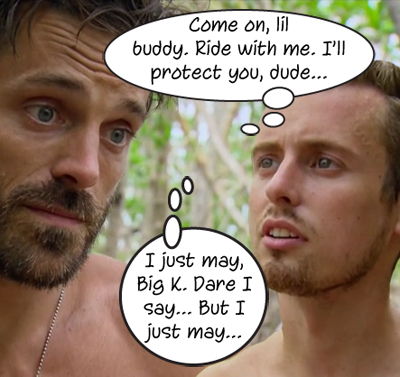 As the tribe heads off to see Jeff, Adam confesses that Ken makes very good points. He does have to think about which side is better for him and Adam knows the whole world is probably yelling at him to vote out the power couple, but he’s just not sure if that’s the right thing for him to do at this point in the game. To Tribal Council! Jeff starts out by pointing out the obvious: there are three Millennials and two Gen Xers so one of them is probably going home tonight. Ken and Jess are aware. Taylor agrees that the Millennials are going to stick together. Figgy pipes in to say that even though Adam voted for her in their first Tribal, she forgives him now. Jeff asks if Adam thinks Figgy look at him in the same way she looks at Taylor and laughter erupts from Figgy because Adam is all like, uuuuuuuh no. Figgy definitely doesn’t think of Adam in the same way as she does Taylor. Call it whatever kind of ‘mance you want, but there’s something going on with them. Of course, Jeff is all over this, asking if it’s true love, everyone laughs, then Jeff points out that he’s an ordained minister. Millennials are known for making crazy, sudden decisions – why doesn’t he just marry them right here and now? More laughter then Figgy says: “Survivor first! Let’s go!” Taylor is like, whaaaat? He asks her if she’s serious, she says she was just saying that it would be Survivor first, both are laughing somewhat uncomfortably. Jeff probes a little more since Taylor is clearly not into the idea, Ken points out that all Figgy was really doing was giving Taylor the opportunity to confirm Figgy’s feelings for him thus making her feel all cozy in the two-week relationship. Jeff then asks Figgy to speak on the fact that she’s not afraid about being open about their ‘mance. She thinks that she and Taylor are just two people voting together like the way that Ken and Jess are voting together. Taylor and Figgy didn’t come to Survivor to meet someone, they are being strategic and she thinks it’s crazy to think of them as a threat, basically. Then Jeff gets to the meat – Adam is in the middle of two voting pairs. Everyone acknowledges that Adam could easily switch and he says that no matter what happens, he hopes the four people that go back to camp will be a strong four. And right before the vote, he says that he really likes the person he’s voting for and he’s sorry that one person is going to leave upset, and one will go back to camp upset. Time to vote! No idols played… So… First vote: Ken, Figgy, Ken, Figgy – Final vote: FIGGY! The couple is devastated… Adam says he will explain if he can.